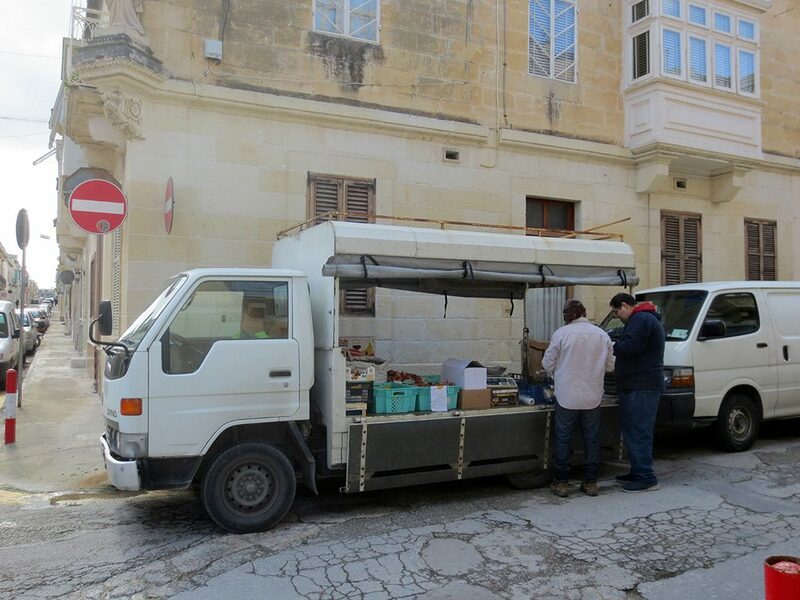 Now familiar with the Maltese bus system from our earlier visit to Mdina, we used it once again to head to the Valletta suburb of Paola. 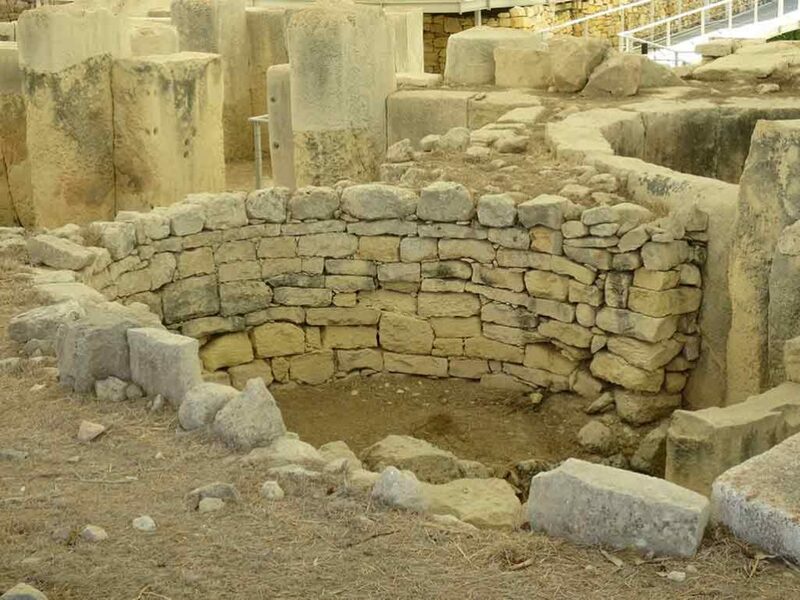 Months earlier, back home, I’d purchased tickets online for the Ħal Saflieni Hypogeum, an underground Neolithic structure that dates back over 5,000 years. 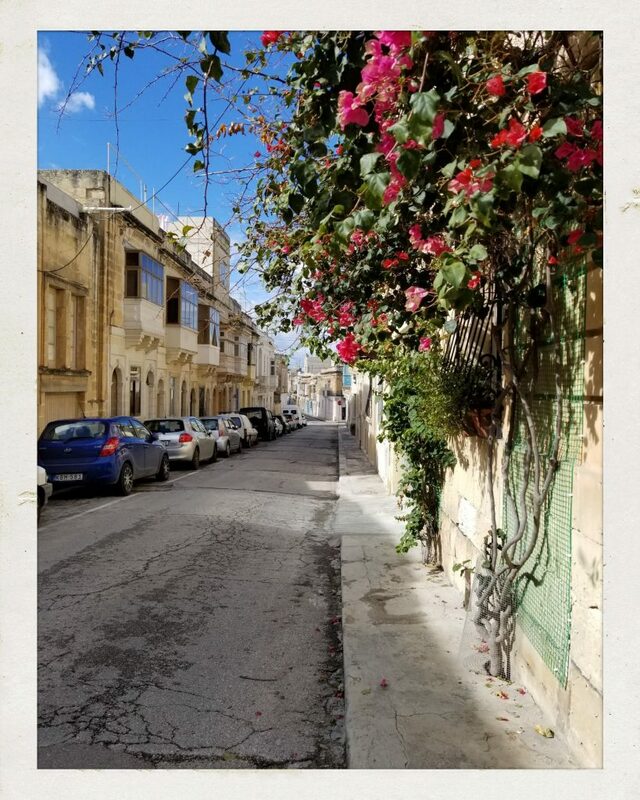 While in Paola, we also visited the nearby Tarxien Temples. 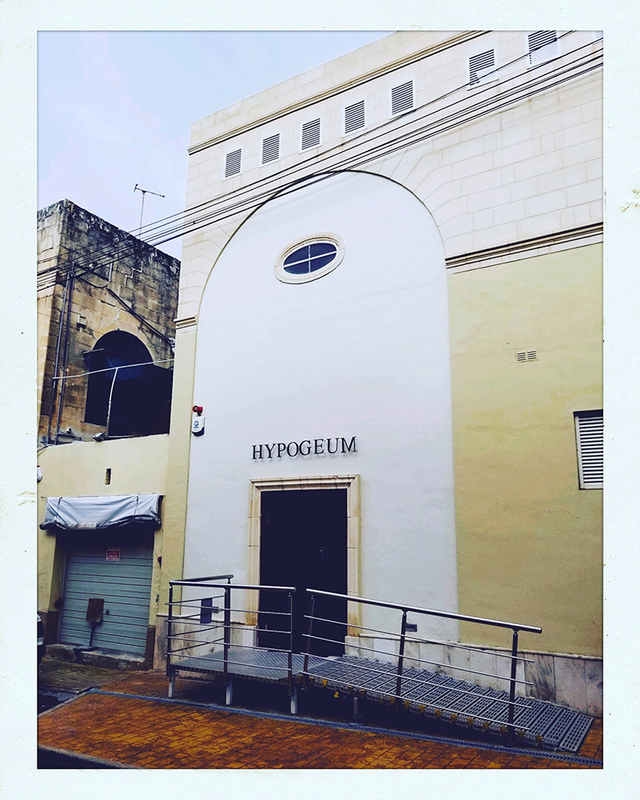 The Hypogeum is not a casual tourist attraction. After past damage to the insides of the tombs from condensation caused by too many tourists, the complex was closed for many years. 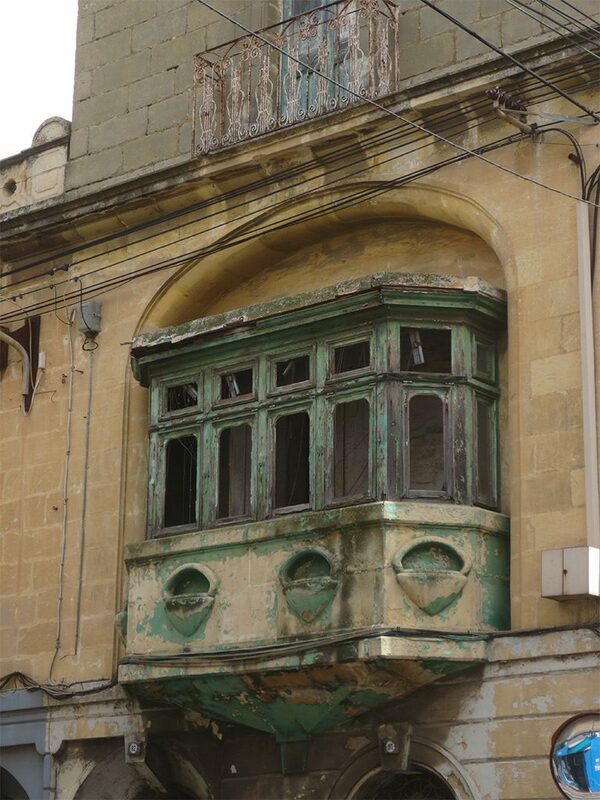 Since it re-opened after restoration a few years ago the number of visitors has been severely restricted. 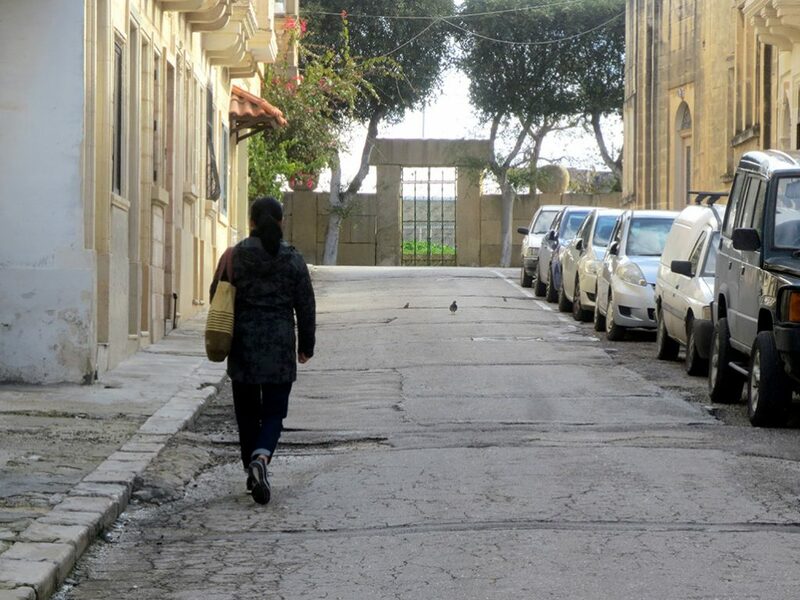 Specifically, only 10 people may visit at a time, on guided tours that happen 6 times per day. Tickets are quite expensive at €35.00 (over $50 CAD) and need to be booked months in advance. Another limitation is that absolutely no photographs are allowed, and they provide lockers in the entrance to secure cameras and phones before descending. With a guide in tow, there is no chance to break the rules. 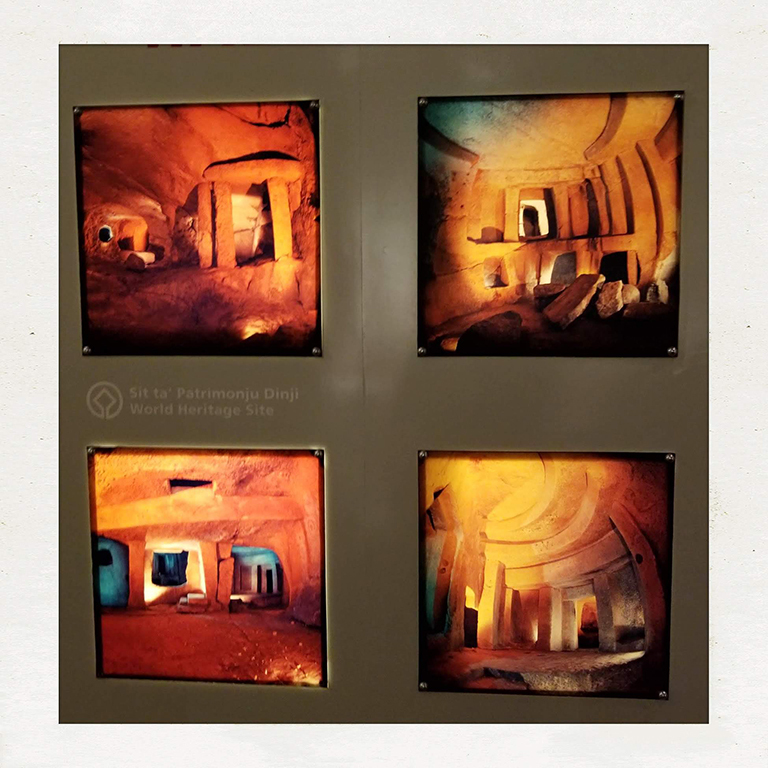 As a result, we don’t have any photos of the incredible Hypogeum to post here — selfishly I wish we did, because the place was incredible, but the experience was likely better without the distraction of trying to find the perfect shot. 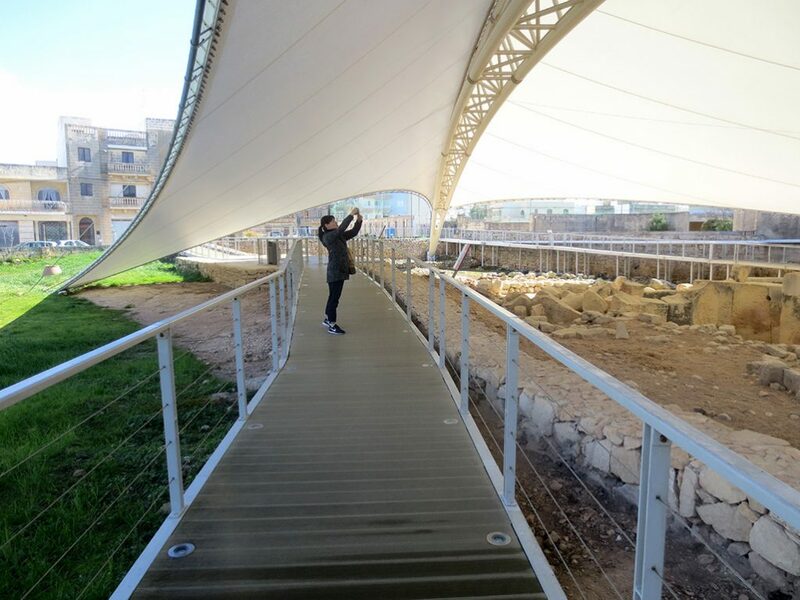 We do have the above photo of a model of the complex layout, which is on display in the National Museum of Archeology in Valletta. Josie also took this photo-of-photos showing the insides of the tombs. 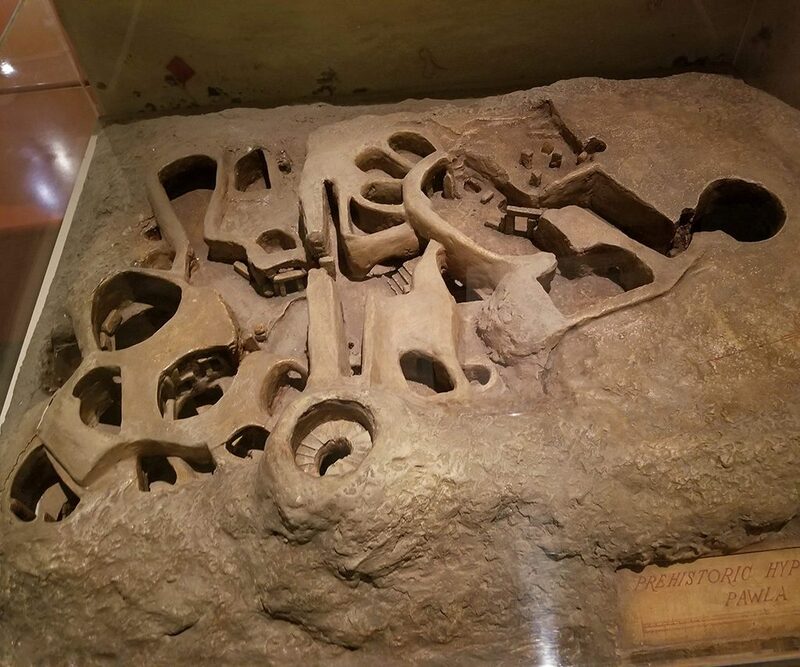 These small photos hint at the dark and eerie vibe of these caverns, which lay completely undisturbed deep underground for many thousands of years until their accidental discovery during house construction in the early 1900s. The caverns were dug in stages, going ever deeper, over many centuries. 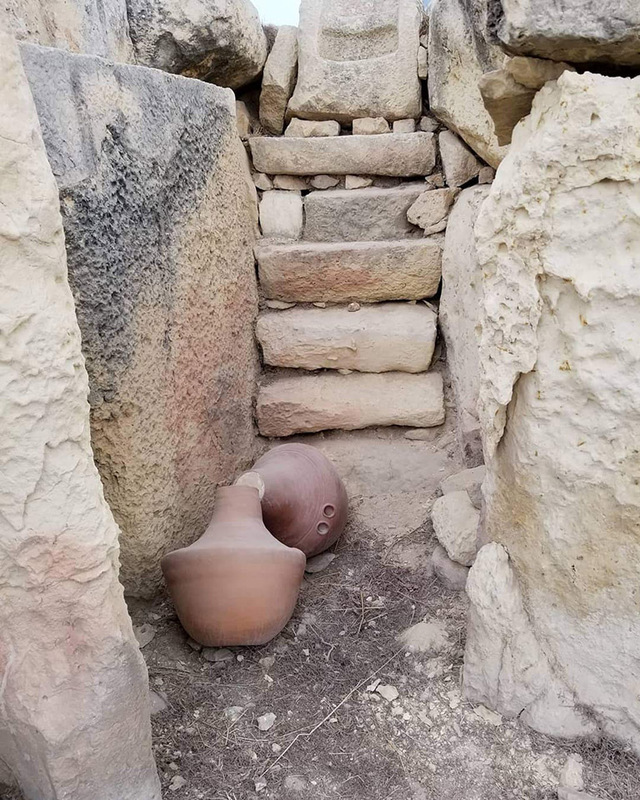 When they were found they contained several feet of skeletons and human remains, almost all of which disintegrated immediately upon being disturbed. No skeletons remain now and the interior is empty. 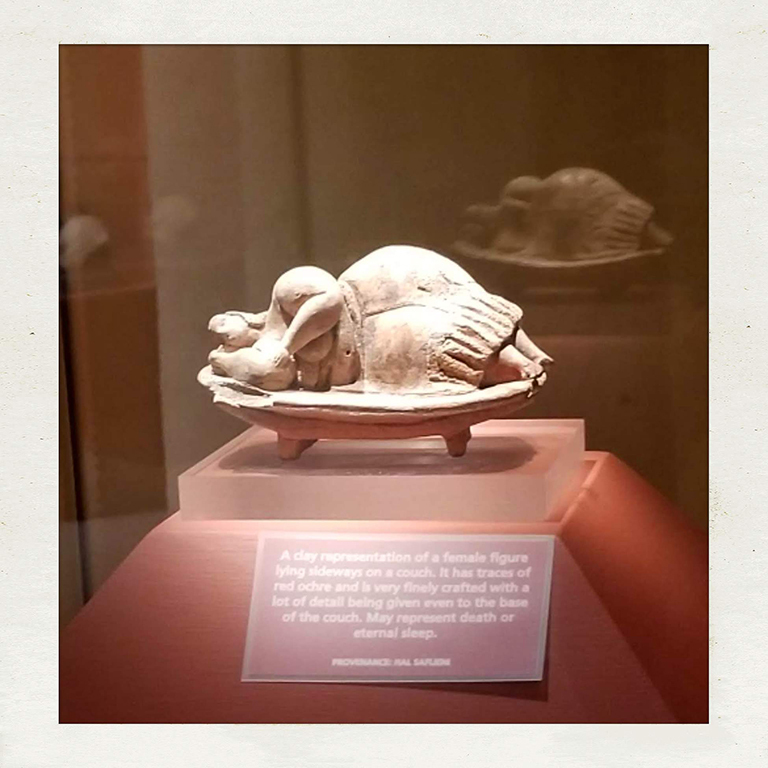 Several significant artifacts were also found in the Hypogeum, including the “Sleeping Lady“, dating to roughly 3000 BC. 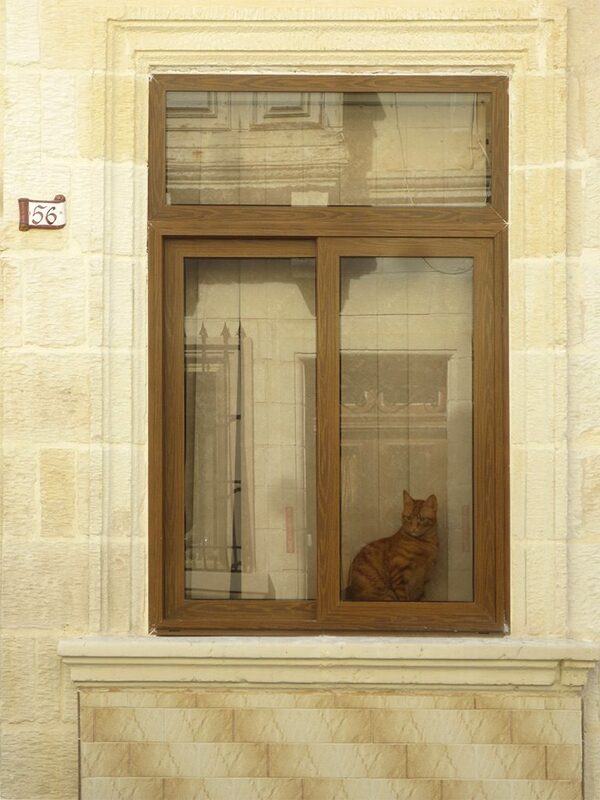 It is a very intricate and subtle carving. 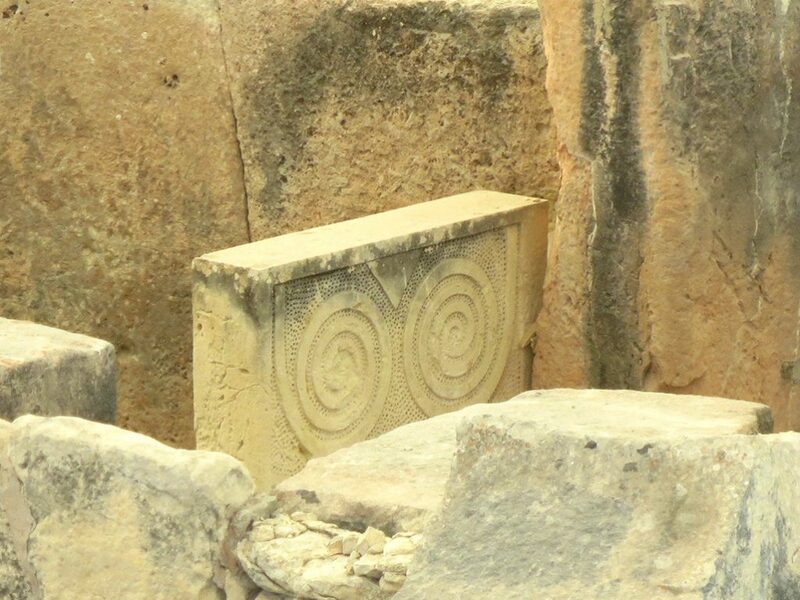 Although there are many theories, the exact intended meaning of the carving is unknown. On our way out, we signed the Hypogeum guestbook and found that the previous couple who had signed it were also from Toronto. We think they may have been on our tour but we are not sure. 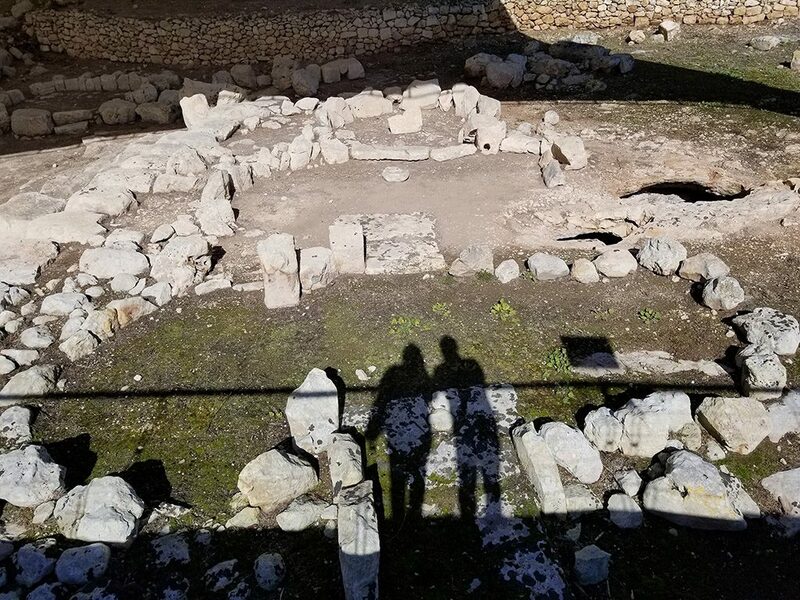 After we left the Hypogeum we headed back out into the sunshine of Paola to walk about 10 minutes to yet another nearby Megalithic site, this one an aboveground set of ruins known as the Tarxien Temples. 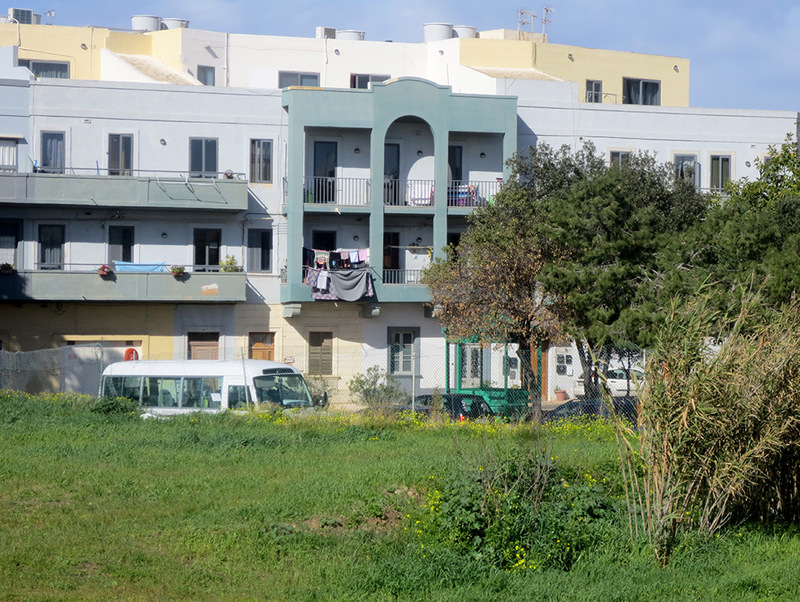 Paola is a suburb of Valletta, fairly unremarkable except for the fact that it happened to grow around (and on top of) some major prehistoric sites. 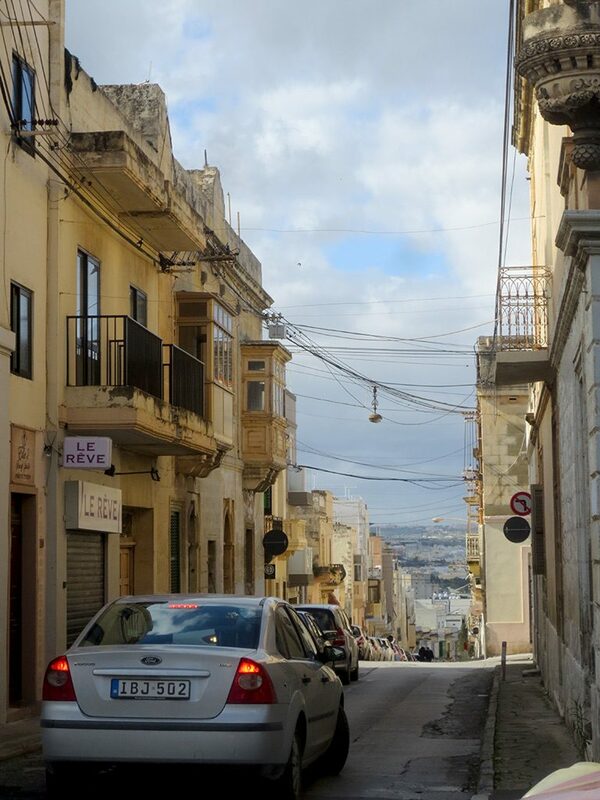 But it was nice to experience a bit of Malta outside the big city, and some of the buildings were beautiful. 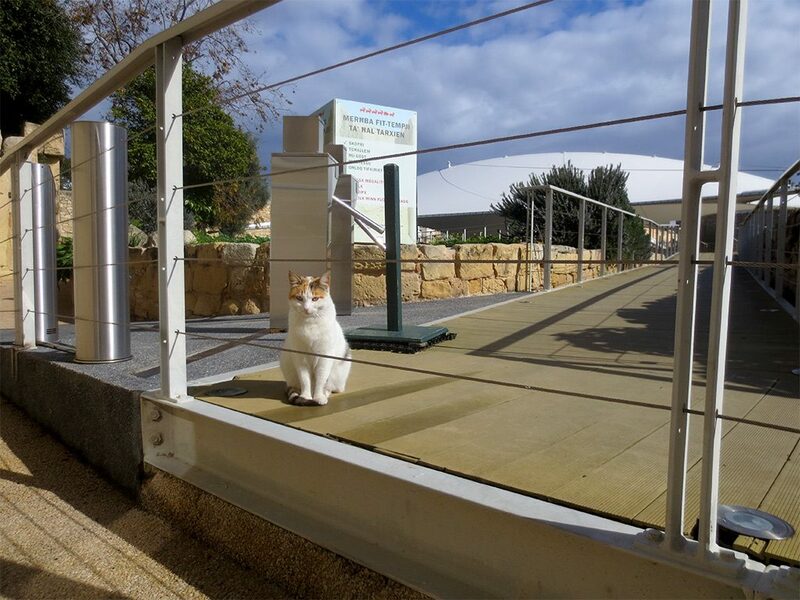 After paying for our tickets in the office, we entered the complex and were greeted by the friendliest cat we met in Malta. That is to say, this is the only one that actually let us pet it. Briefly. 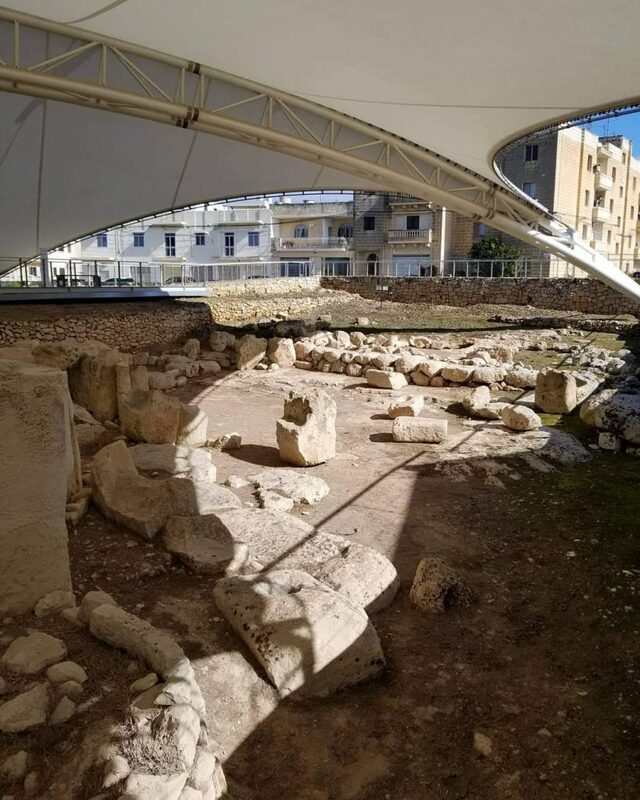 The Tarxien Temples site consists of the excavated remnants of three adjacent temples dating from between 3000 and 3250 BC. 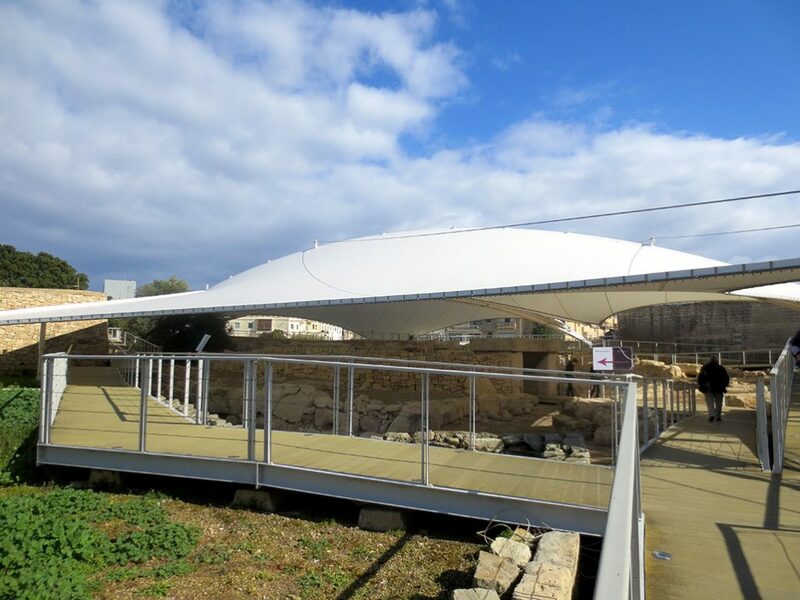 A few years ago the temples were covered by large tent-like structures in order to protect them from the elements. I was selfishly concerned this would ruin their appeal, but that wasn’t the case as the covers are quite far above the stones. A set of walkways twist between the various temples to provide good views. 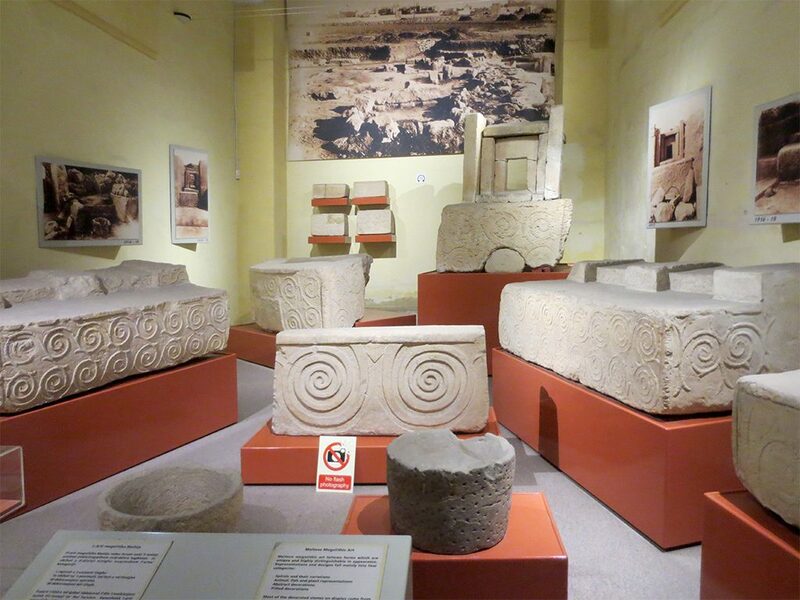 Any valuable or fragile carved stones have long ago been removed from the temples, but many of those now reside at the National Museum of Archeology in Valletta. 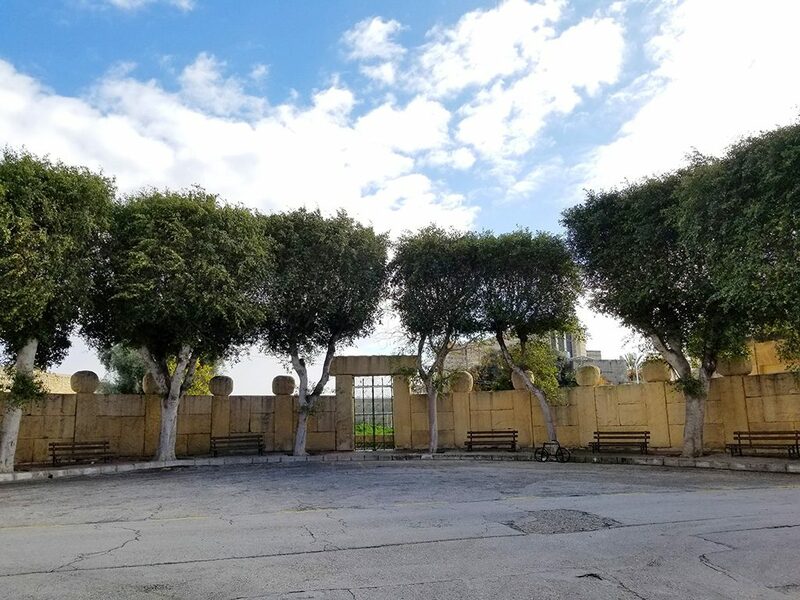 In the 1950s some not-so-good restorations and recreations were attempted on one of the three temples, including some newer elements built from concrete. 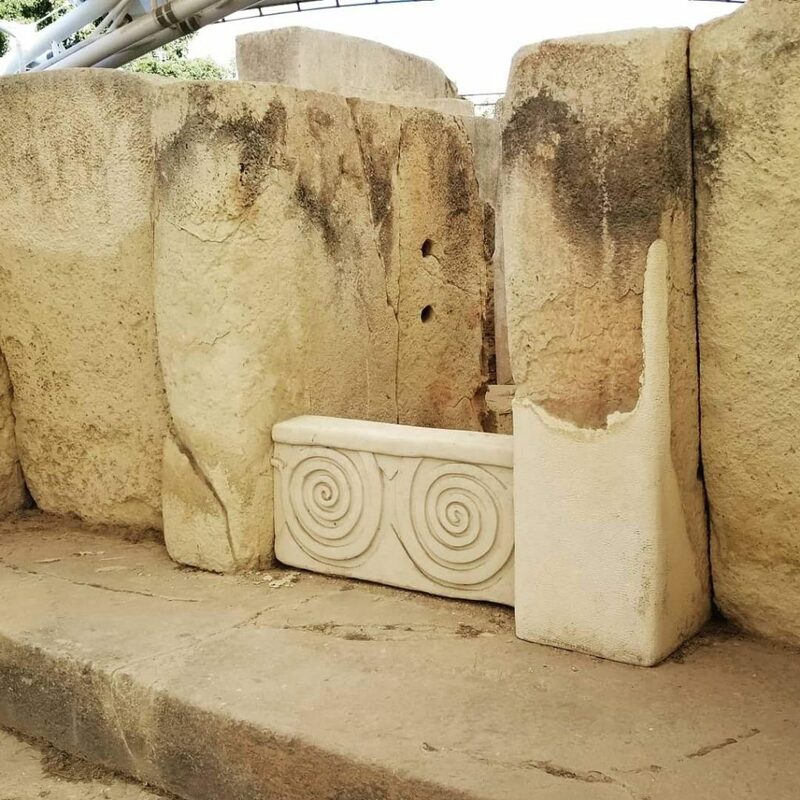 Amazingly, after barely 50 years, these modern replicas have already weathered much more than the original stone carvings did after 3,000 years in the elements. 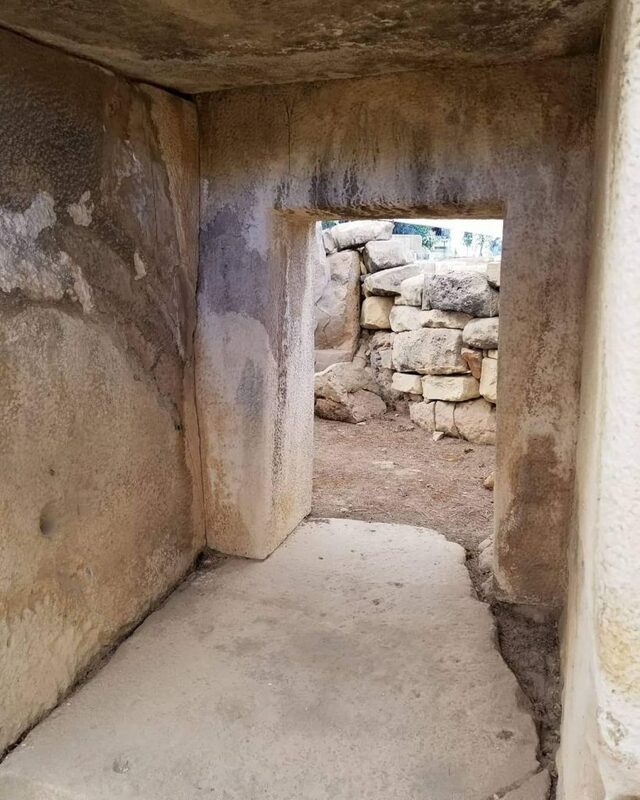 Despite the helpful signage, it was hard to keep straight all the various phases of the temples and the speculated purposes of specific rooms. But it was enjoyable nonetheless to wander between the stone walls and imagine how difficult it must have been for people to construct these temples thousands of years ago, with no modern machinery. 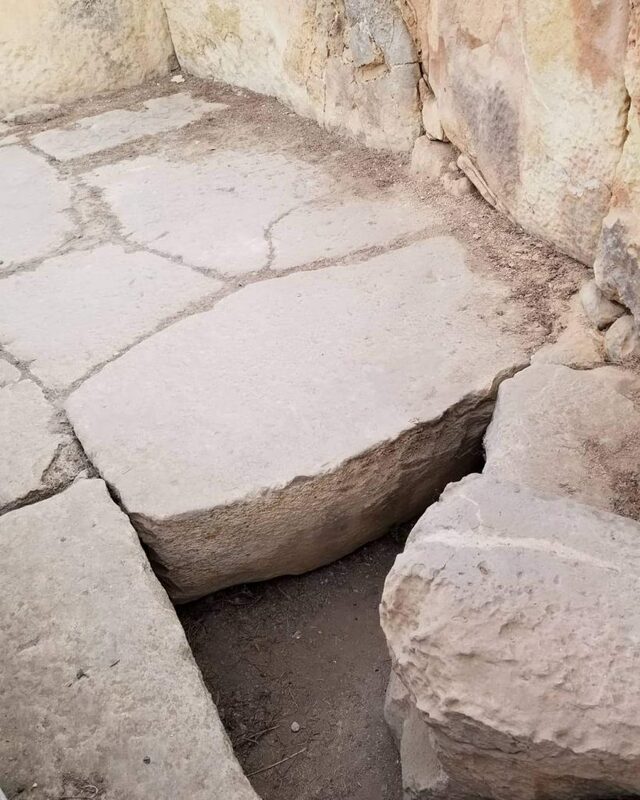 If you’re curious about the best way to make a floor last 3,000 years, the secret is to make the floor stones thick. Really thick. 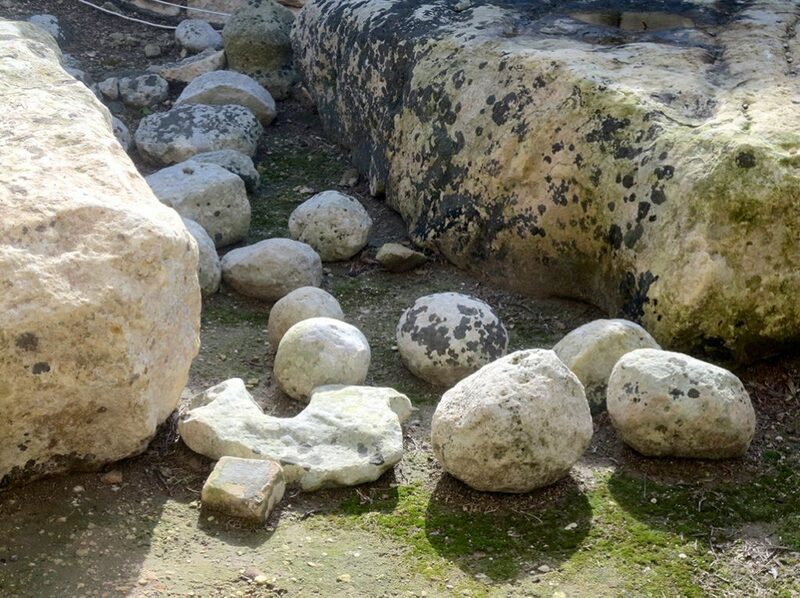 Smaller smooth, round stones are often found strewn about prehistoric temple sites in Malta. 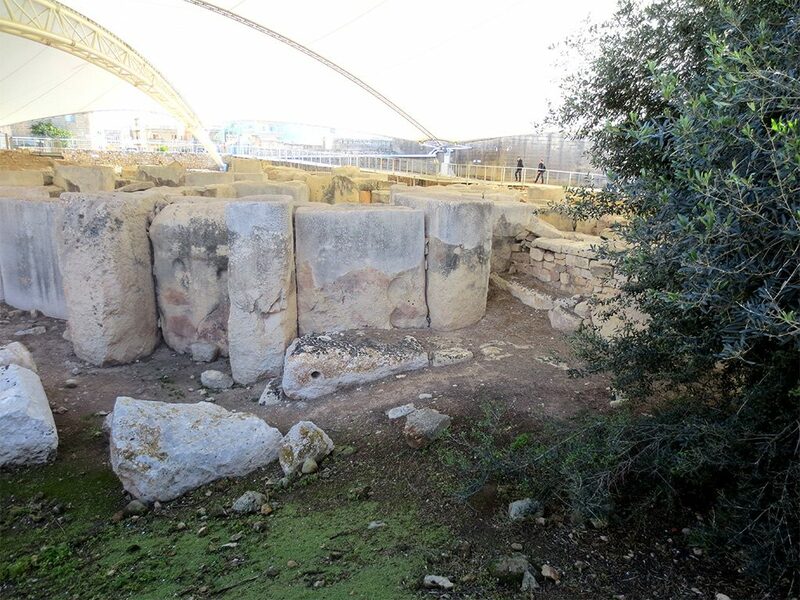 The theory is that they were used as rollers to help transport and pivot the larger stones. Absorbed in looking at all these ancient stones it was easy to forget we were in the middle of a modern residential neighbourhood — the view behind us was a quick reminder. 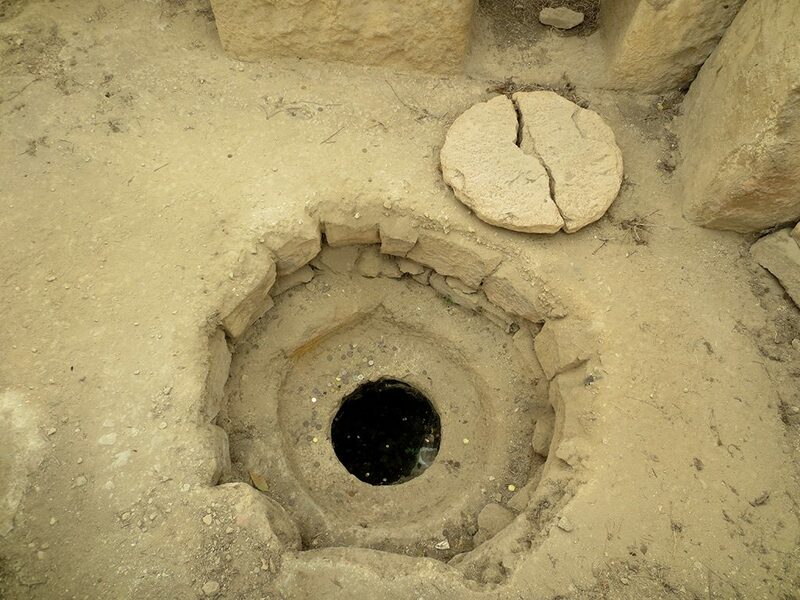 It’s fun to imagine the emotions of the archaeologist who first discovered this sealed underground storage chamber, broke open its round lid and discovered that it contained…. nothing. True story. 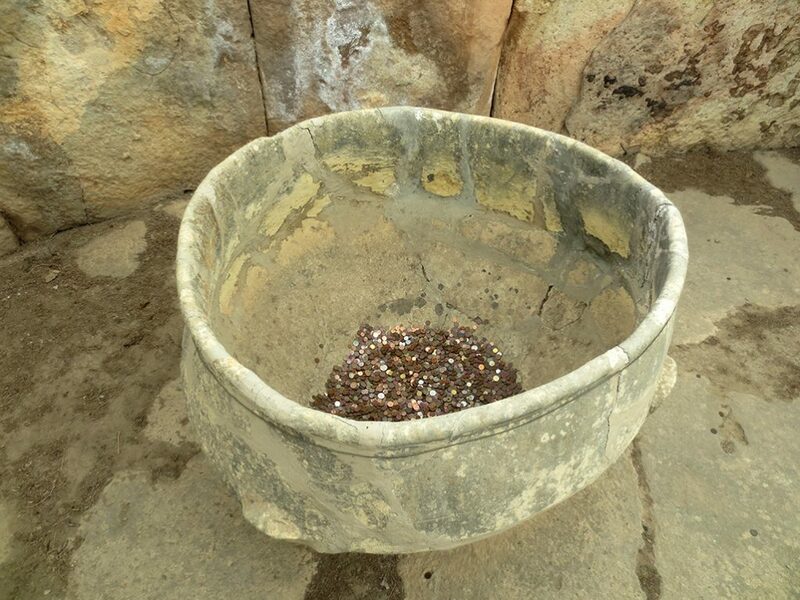 This giant pot is a replica, with the original stored in the museum. I’m unclear if the original contained coins, I think modern visitors threw these ones in there.